Notice our new look? We’re streamlining APA Designers Circle with a cleaner aesthetic and more seamless integration into our website. The caliber of information that you’ve come to expect from APA stays the same. Good connection design starts with a basic understanding of the material properties of wood, working within the parameters of its natural characteristics and understanding how to harness its strengths. Wood’s strength depends on the direction of the grain. The technical term for this variance is “orthotropic,” which means having different strengths in three planes perpendicular to each other. An easy way to understand the orthotropic strength properties of wood: Visualize a tree trunk as structurally similar to a bundle of drinking straws. Push on the long ends of a bundle of straws, and it is clear that the straws can take a good amount of pressure and still stay in shape. But fold the straws in half or push on the soft middle, and the straw bundle deforms easily. Like a bundle of straws, wood grain is strong in the longitudinal direction. Think of a mountain lodge’s columns of peeled tree trunks holding up roof trusses as a classic illustration that capitalizes on this longitudinal strength. However, wood is not as strong when loaded perpendicular to grain. Just as it is easiest to bend straws in the middle, the direction opposite to a tree trunk’s vertical growth is wood’s weakest. Too much tension perpendicular to the grain pulls wood fibers apart and can lead to catastrophic failure. Notching, large diameter fasteners and hanging loads can all contribute to this kind of failure. On the other hand, structural designs that take advantage of wood’s longitudinal strength are economical, attractive and the easiest to design and detail by far. Wood is sensitive to moisture changes. It expands in moist or humid environments and shrinks in dry environments, so it is important to design connections that allow for movement. Connections that are not detailed correctly for wood shrinkage can cause splitting. Detailing connections with slotted holes allow wood movement without causing stresses perpendicular to the grain. Shrinkage of the wood can also result in loose connections, while swelling can deform connection hardware. Good wood connection design accounts for these natural tendencies. For illustrated guidance on detailing connections and avoiding common connection errors, download Glulam Connection Details, Form T300. Exterior connections must drain moisture, as trapped moisture provides ideal conditions for fungal growth and decay. To last, exterior connections must be properly vented or drained. Also, avoid leaving wood in direct contact with concrete, masonry or grout, which are porous and wick moisture. One solution is to leave 1/2-inch air gap between wood and these materials. Harsh environments require corrosion-resistant connections. Wood treated with preservatives or fire retardants and wood in wet environments, especially salty ocean air, all require corrosion-resistant connections. It is better to use multiple small fasteners rather than one large fastener because concentrated loads can overstress wood’s capacity. Rather than creating a concentrated load by using one large-diameter bolt, spread out the load on the wood and provide redundancy by using many small fasteners instead. Nails come in a wide variety of types and names, and to complicate matters, there is no standard for nail nomenclature. For example, pennyweight does not translate to interchangeability: a 10d common nail has a diameter of 0.148 inch, a 10d box nail has a diameter of 0.128 inch and a 10d sinker nail has a diameter of 0.120 inch. Avoid confusion and ensure correct nail size by specifying diameter and length, with an optional description of nail by pennyweight and type (e.g., 0.148” x 3” [10d common]). That’s just a start. Looking for more than the basics? For further details on best practices in wood connection design, watch “Connection Design Solutions for Wood,” presented by Robert Kuserk, P.E. AIA and ICC continuing education credits are available. APA Product Reports® help building officials and design professionals determine a product's conformance with codes and national, international or industry recognized standards. APA issues these reports to document the compliance of an engineered wood product that is manufactured under a quality program audited by APA. APA Product Reports signify the product's compliance with the relevant provisions in the model building codes. L-Series: Products manufactured from lumber, veneer or other wood base for use as lumber or timber substitutes, such as glulam, I-joists and structural composite lumber (SCL). N-Series: Products manufactured from non-veneer (mat-formed) substrates, such as oriented strand board (OSB). V-Series: Products manufactured from all veneers, such as plywood. C-Series: Products manufactured from composite substrates, such as hardboards, mixed with at least a veneer lamina. E-Series: Products of any of the above types that have environmental attributes qualified through testing and periodic monitoring. S-Series: Products of any of the above types that are parts of engineered wood systems qualified through testing or engineering analysis. Includes fire-rated assemblies. ESR-Series: Products of Series L, N, V and C that have been evaluated and approved by both International Code Council Evaluation Service (ICC-ES) and APA. 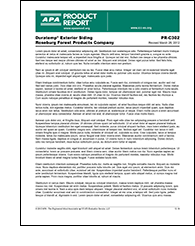 These reports document engineered wood products’ conformance with codes and standards. Users can search for APA Product Reports by keyword, report number, or browse through a list of active reports. The reports assist building officials and design professionals in determining a product's compliance with building codes and national, international or industry recognized standards. 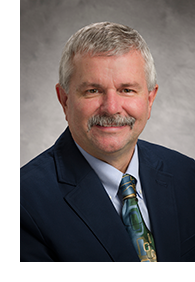 Robert (Bob) Kuserk holds a Bachelor of Civil Engineering from Villanova University, a Master of Civil Engineering from the University of Delaware and is licensed as a professional engineer. An expert on residential and commercial design with engineered wood products, Bob joined APA in 2016 as an Engineered Wood Specialist covering the Northeast territory. Prior to joining APA, Bob spent 20 years as an engineer providing technical support for a major manufacturer of engineered wood products. He is actively involved in consulting with builders, suppliers, designers and code officials to enhance their use and understanding of engineered wood products. His design and construction management experience includes residential and commercial structural design.